After seeing the Twins pull even with three-run eighth, the Brewers regrouped in the ninth inning on Tuesday afternoon at Target Field, jumping ahead for good on Scooter Gennett's RBI single en route to a 6-5 win. Yadiel Rivera sparked the rally against closer Kevin Jepsen with a one-out double to right-center field. Center fielder Byron Buxton bobbled the ball off the wall, allowing Rivera to reach third. With the infield in, Gennett roped a grounder to left to score Rivera. "That hit that 'Yadi' got was huge," Gennett said, referring to Rivera. "It's not easy coming off the bench and being able to drive a ball like that into the wind." "We had a lot of good things happen today," Brewers manager Craig Counsell said. "A lot of guys helped out. That's a good win." The Twins struggled offensively until breaking out for three runs in the eighth to tie the game.Byung Ho Park crushed a solo homer to left -- his second deep fly in as many days and his team-leading fourth of the year -- before Eddie Rosario connected on a pinch-hit two-run homer to tie it at 5. "We try to look for positives, and we stayed with the game," Twins manager Paul Molitor said. "We were able to bounce back and get it even heading into the ninth. So it was a nice rebound after the White Sox series to finish with a decent homestand [and win four of five.]" Brewers right-hander Wily Peralta, who entered 0-3 with a 10.13 ERA, showed some improvement, allowing two runs on five hits and four walks over five-plus innings and retiring 10 batters in a row at one point. He loaded the bases with no outs in the first two innings but escaped relatively unscathed both times, allowing one run in each frame. Twins right-hander Ervin Santana went five innings, surrendering five runs (two earned) on five hits and three walks. He gave up two runs in the first on a single by Ryan Braun and a sacrifice fly by Chris Carter. It unraveled for the Twins and Santana in the fifth, starting with an error by right fielder Miguel Sano with one out. The trouble snowballed from there, asJonathan Lucroy gave the Brewers a lead with an RBI double before Carter added another sac fly and a passed ball by John Ryan Murphy brought home another run. Trouble for Thornburg: Park and Rosario connected against a Brewers reliever who had been untouched so far this season. Tyler Thornburg had been unscored upon in his first five appearances, surrendering only two hits. He has also stranded three inherited runners, including a pair in the seventh inning on Tuesday. Sano misplays sinking liner: The Twins know Sano is facing a steep learning curve with his move to right field, but his inexperience cost them in the Brewers' go-ahead three-run fifth. With one out, Gennett hit a sinking liner to right, but it hit off Sano's glove for an error. The Brewers went on to score three unearned runs after Sano's missed catch. 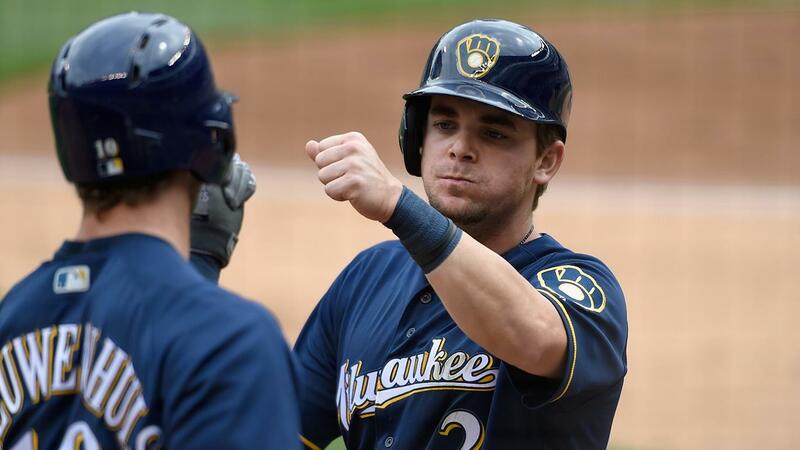 Good and bad: Brewers Rule 5 Draft pick Colin Walsh had an eventful afternoon, beginning with a double leading off the game that set up Milwaukee's first run and marked his first Major League hit after an 0-for-10 start. But Walsh was partly responsible when a run got away an inning later, as he misfired a throw home on a potential double-play bouncer, extending the inning before the Twins tied the game at 2. Still, Walsh savored celebrating with teammates after the game. "It's nice that it's finally done," Walsh said. "It's a little harder when you're not playing every day, because 10 at-bats is three bad games [for a starter]. On the bench, it's 2 1/2 weeks. ... Hopefully, there are a lot more hits coming." Twins can't capitalize early: The Twins scored their first run on a double-play grounder hit by Sano in the first, then scored in the second on an RBI groundout from Eduardo Nunez, but considering the bases were loaded each time, the unfinished rallies left a sense of disappointment. The Twins have yet to record a hit with the bases loaded this year, having gone 0-for-9. Rosario's pinch-hit homer was the first for the Twins since Sano hit one against the Royals on Sept. 9, 2015. It was the only pinch-hit homer of the year for Minnesota last season. Brewers: The teams shift their Border Battle to Miller Park for two more games beginning on Wednesday, when Jimmy Nelson will take the mound for Milwaukee beginning at 7:10 p.m. CT. Nelson is 3-for-3 this season in producing quality starts and has held opposing hitters to a .176 average. Twins: Left-hander Tommy Milone will get the starting nod for Minnesota, looking to shake off a slow start. He's 0-1 with a 5.06 ERA through two starts.